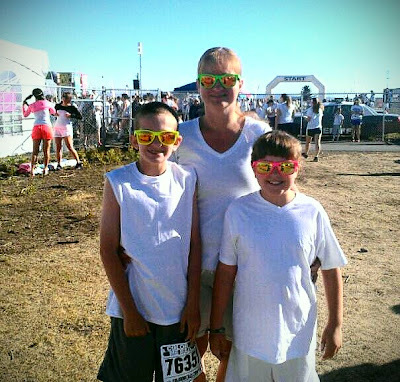 Being Frugal and Making It Work: Color Me Rad - Colorful 5K Run from Start to Finish! Color Me Rad - Colorful 5K Run from Start to Finish! A few months ago my nine year old daughter saw an advertisement for Color Me Rad, and asked if we could go. 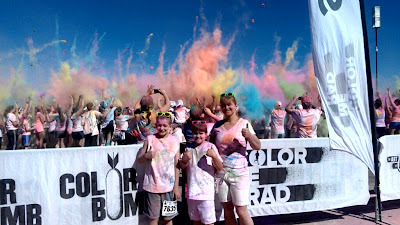 I will admit that it looked like a ton of fun, but I was a little concerned about the cost of this 5K color run... after all, I'm all about being frugal and getting great bargains. 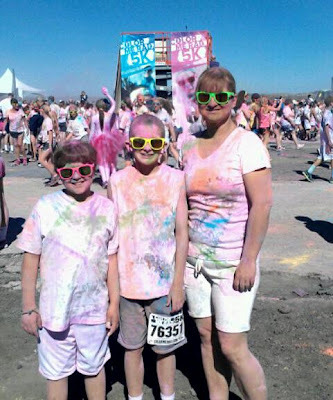 As the weeks went on, each time we would see a poster or ad for Color Me Rad, she would ask and at one point I think she may have been begging! I explained to her that it would cost $140 for our family to participate (if we pre-registered) and that I would have to think about it. The more I thought about it, the more I began wanting to do it. The closer it got to race day - the more I thought about it and how much FUN we would have together. So, I finally decided to take some of my frugal savings and use it to create a fun memory that my daughter would be talking about for months! The morning of Color Me Rad Spokane, we had to get up very early for a Saturday morning. My daughter kept asking why we had to get up so early on a weekend and why we were all wearing white clothes. Trust me, we NEVER wear all white for obvious reasons. The drive from our house to the race was 45 minutes. As we walked from the parking lot towards the race entrance, there were Color Me Rad 5K banners, tons of other race participants dressed in white and other silly outfits. My daughter was too busy paying attention to all the people that she didn't even notice the signs. The look on her face and the excitement in her voice was worth the wait and the registration fees. Her face lit up, her eyes were sparkling and she had the BIGGEST smile on her sweet little face. We were hit with color bombs, the music throughout the entire course was fun and upbeat, and everyone was having such a great time! We saw some of the funniest and craziest outfits: from funky knee high socks and tu-tus to a gorilla and unicorn! We were covered in color from head to toe, and everywhere in between! In our ears, up our nose, and my 12 year old son had the brightest pink hair I've ever seen! 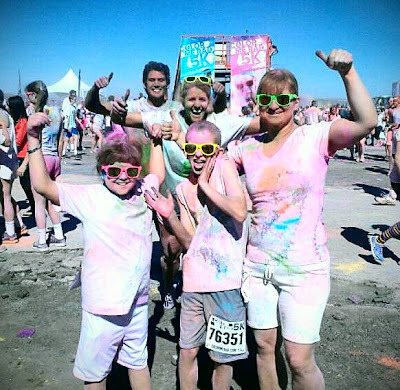 Thumbs up for Color Me Rad! 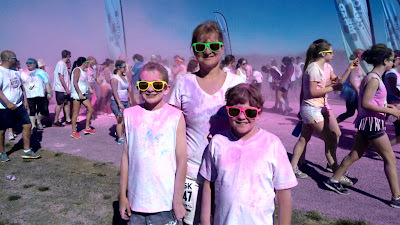 We had a color run around here a few weeks ago, but couldn't afford to register. Looks like fun! I've always wanted to do a color run. This makes me want to do one even more!